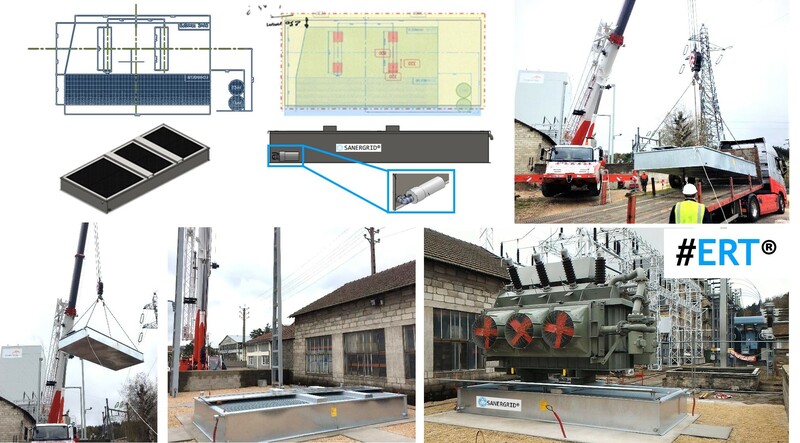 SANERGRID lead the project from 2D design, 3D visualization, manufacture, delivery, crane and installation of the power transformer. After dimensioning of the load distribution plates, dimensioning of the oil retention tank for outdoor use with filtration system for oil polluted waters SPI PETRO PIPE and siphon by pass system. And finally, on the top of the retention tank, an EXTICOV ™ extinguishing cover on the top of the ERT® and non-slippery gratings for easy maintenance of the transformer. SANERGRID then coordinated the delivery of the tank and the operation of craning on site to allow the installation in a few minutes. The transformer could be installed and assembled on its new retention the next day. For more information on transformer passive fire protection and SANERGRID® rainwater drainage system SPI for oil contaminated rainwater, please contact us.